Going old school - learning poems "by heart"
This year I am reading 'Love That Dog' by Sharon Creech for the first time with my year 8s. It is a novel written in free verse diary entries from the point of view of Jack, a reluctant reader of poetry. His teacher, Miss Stretchberry, has asked him to write his responses to poems such as "Stopping by Woods on a Snowy Morning" by Robert Frost, "Tyger, Tyger" by William Blake and "Love That Boy" by Walter Dean Myers. It's brilliance is in its ability to force children to make connections between texts and develop their own insights to literature. This text is quite easy to understand; however, if children know the poems Jack is reading they will understand it on a much deeper level. I realised I could either read the poems referred to in the text with the children or assign them for homework. Realistically speaking, I knew that if I assigned them the poems to read at home it would be likely that they would not read them closely and not understand them in context to the story. I work in a special school, and while the children are able in many ways, at times they have many barriers to learning and studying independently. Due to time limitations, I wasn't sure I could read the poems and the text all in class as well. So, I needed a third option. I have been teaching in primary and secondary for eleven years and in all that time I have not asked a child to memorise a line of poetry. As a child of the 70s and 80s however, I often was assigned tasks to memorise as I was taught by nuns who were used to such teaching methods. I can remember vividly a yellow card with timetables I was given to memorise. At the age of 8, I memorised the Hail Mary and Our Father for my First Communion; to this day they are etched in my brain no matter how far I fall from the church. In high school, I was given passages of Hamlet and The Merchant of Venice to commit to memory and perform in class. For centuries, poetry was not something to be read in silence, but was a treat for listeners. It's rhythm and beats are best revealed when performed. 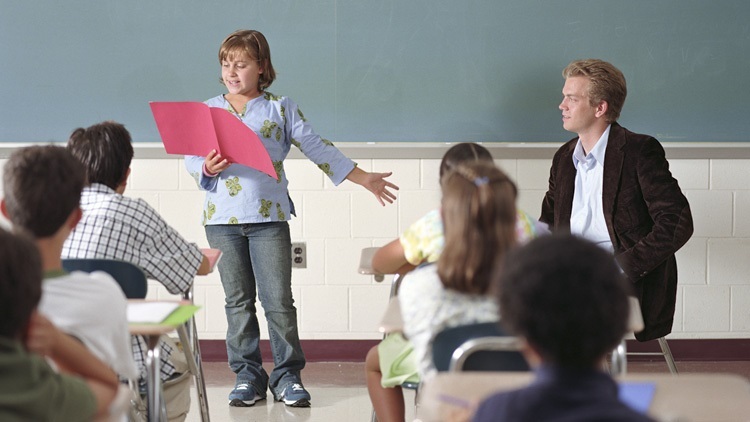 Memorising poems not only forces the pupil to learn rhythms of the words, but gives them an opportunity to experience poetry as an aural delight since its meaning is lies in the sound of the words as well as their meanings. I consulted with our head of English to see what she thought, and she was agreement that memorising poetry is good for pupils. I decided I would set the poem Stopping by Woods on a Snowy Morning by Robert Frost. I handed out the poems, unsure how the children would respond, and surprisingly, they were delighted. Tom*, one of my more able pupils, said that he'd had to memorise poems at his primary school. Another, Ali started to commit it to memory right then and he was smiling about it. Ali had just come to us last year from Iran with little English. He often tells me how he does not like reading, despite working hard and always doing his assignments. Finally, one of my weakest readers, Mandy, a girl who shows dyslexic tendencies (but yet to be diagnosed) memorised the first line in five minutes. I think, for most of the children, this was a straight forward assignment and so they would enjoy doing it. When the day came to perform our poems the children out-did themselves. All of them committed to memory the minimum first four lines, but many of them had risen to the challenge of learning the whole poem. In particular, Ali was fluent and had got the rhythm of the poem down. Mandy, a girl who normally speaks so quietly, spoke clearly and it was riveting to hear her say the poem. She beamed when everyone applauded her. After our performances we discussed their impressions of the poem and they spoke about it with an authority I hadn't seen in them before. I think this is due to the fact that I had forced them to spend time with this poem. "Miss, I think this man is lonely and probably cold since it is winter," said Ali. Mandy agreed adding, "Yeah, I wonder where he is going and where is his family?" Despite my misgivings that rote memorisation is an outdated teaching method, I think it has a place when children are studying poetry giving them a chance to learn "by heart" the rhythms of poetry as well as allowing them to take their time with the words. I will definitely assign them another poem and am looking forward to their performances of "Tyger, Tiger," by William Blake. Ms O'Hare, a US native, has taught in the UK for the past 11 years at the primary and secondary levels. Currently she works at a special school in England.